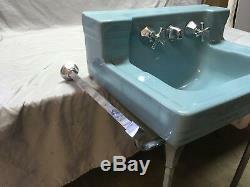 Very nice vintage Mid Century ceramic blue porcelain shelf back bathroom sink with chrome plated brass legs and towel bars. It is marked Standard and is dated Feb 15, 1954. 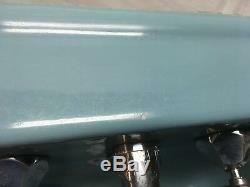 The porcelain shows normal wear, light scratches , scuffs, and some pockmarks. 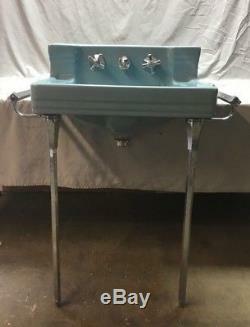 It has its original faucet attached, handles to turn freely. 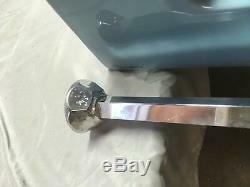 The Chrome Plated brass legs and towel bars are scratched, with some oxidization and minor pitting. The legs are adjustable for easy leveling on a uneven floor. 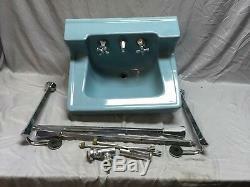 This sink will need a wall bracket and possibly other hardware for installation be sure to check with your plumber. 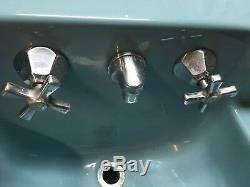 Please take into consideration these old sinks are very hard to photograph, many of the minor blemishes do not show up in the pictures but can be seen in person. 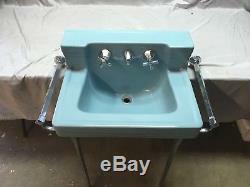 Overall this sink is in good condition. Please look over the pictures and ask questions when needed. Overall - 8 1/2"tall x 22 1/2"wide x 18depth. 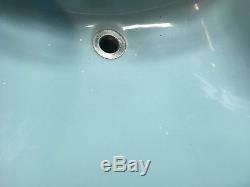 The basin is 15 1/4"wide X 11"depth x 5deep up to the overflow. Legs- 27 will adjust up to 28 3/4"long 1"diameter. 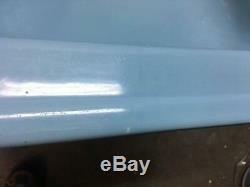 Towel bars- 16"long and are 3/4". 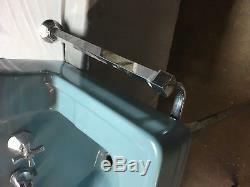 The item "Vtg Mid Century Ceramic Blue Bath Sink Chrome Legs Towel Bars Standard 225-18E" is in sale since Wednesday, July 11, 2018. 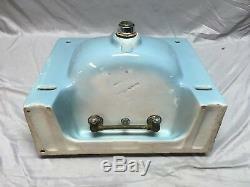 This item is in the category "Antiques\Home & Hearth\Sinks". 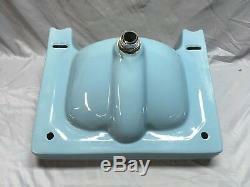 The seller is "nysalvage" and is located in Oneonta, New York. This item can be shipped to United States.